Florida is a retirement destination for most active adults, and The Palace at Coral Gables toys with royal inspiration, giving independent and assisted living seniors elegance and innovation. Standing nine stories tall and emitting an exterior superior to that of its surrounding buildings, The Palace at Coral Gables justifies its royalty-inspired name by redefining the meaning of senior living. With a nod towards Mediterranean architecture, The Palace at Coral Gables includes 243 units for independent and assisted living active adults. Positioned centrally in Coral Gables, Florida, The Palace revolutionizes the retirement community with breathtaking interior designs and innovative technologies incorporated to assure residents that safety was a prominent concern in its design. The aging in place and universal design features within the numerous different apartments were designed to aid seniors with different health needs. These additions include barrier-free entries in bathrooms and safety handrails, built-out storage and closet systems to maximize accessibility and raised toilets that were orthopedically-designed to provide users with stability and comfort. Walk-in bathtubs are installed to improve safety and reduce injuries, and wall-to-wall medicine cabinets for extra storage. Inspiration for the design for The Palace was one of the upmost luxurious, exuding Mediterranean, French, and modern appeal. Retirees can choose to match the beauty of the surrounding environment with the sheer presence of the exterior and interior of The Palace. “The city of Coral Gables is one of the most beautiful and desirable places to live and work in South Florida and there has been a concerted effort to bring a full service facility for local seniors for years. When ‘The Palace’ invited us to be a part of their team, we knew that it was the perfect match for this city and the ‘empty nesters’ looking for a special place to enjoy their leisure years,” explained John Pierce Fullerton, AIA, President of The Fullerton Group Architects. “The inspiration for the design evolved from the Mediterranean Revival vision and legacy of the city’s founder Geroge Merrick. Modern interpretations of his expressive style in architecture, especially larger buildings, are difficult and expensive. However, the history and tradition of The Palace in its decades of service in this genre, is absolute dedication to excellence in quality, design and material selection. This allowed us to work within a rich creative flexibility while maintaining the strict requirements of the specific uses within,” Fullerton continued. Although architecturally The Palace emits a powerful sense of old-world luxury, technology was another important component of ensuring that this Florida retirement community was far beyond anything designed in the past. Customized colored marble flooring, multi-tiered Muranoinspired, crystal chandeliers, French-style carved moldings, Venetian plaster walls, soaring ceilings, and dramatic windows are one of many reasons The Palace entrenches residents in decadent interior design. Televisions throughout common areas add extra entertainment options for the independent and assisted living residents. These systems provide ambient music to 15 relaxation areas with individual audio controls that can enrich volume in separated speaker units. The Palace at Coral Gables also encourages community unity by providing a movie theater and luxury pool area. The in-house theater is fit with soundproof walls, professional stage lighting, and independent listening systems for the hearing impaired. 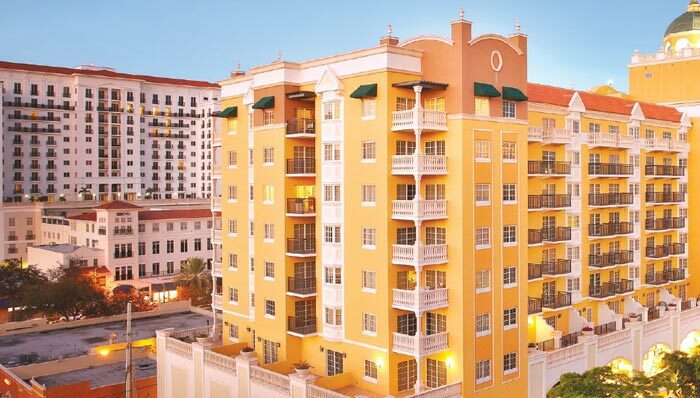 “The level of luxury and attention at The Palace at Coral Gables sets the community apart. From customized floor coverings and tapestries to multi-tiered crystal chandeliers and inlay marble flooring, the level of finishing and extraordinary quality will be second to none,” said Adam Rosenblum, Vice President of Sales and Marketing for The Palace Group. Amenities spanning from easy access to the bustling downtown area to high-end spa and pool options enhance the overall elegance of The Palace. A beauty salon, wellness center staffed by physicians, fitness and aerobics studio, a library, and over-the-top pool evoke only the grandest lifestyle. Whether formal, casual, independent, or assisted living is needed by a potential resident, the top-notch quality of The Palace at Coral Gables has the potential to attract numerous different seniors while also standing tall as a unique and innovative community. According to Shaham, this community, inspired by decadence and luxury, is sure to give the 50+ housing market an example of success. This is a comment to the admin. I discovered your Active Living at its Most Luxurious – 50 Builder Media page by searching on Google but it was difficult to find as you were not on the front page of search results. I know you could have more visitors to your website. I have found a site which offers to dramatically increase your rankings and traffic to your site: http://hud.sn/6sk5 I managed to get close to 500 visitors/day using their service, you could also get many more targeted traffic from search engines than you have now. Their services brought significantly more visitors to my website. I hope this helps! Pretty great post. I simply stumbled upon your weblog and wished to mention that I’ve really enjoyed surfing around your blog posts. After all I will be subscribing to your rss feed and I’m hoping you write once more very soon! Hi There! We are looking for experienced people that are interested in from working their home on a full-time basis. If you want to earn $200 a day, and you don’t mind creating some short opinions up, this is the perfect opportunity for you! Simply click the link here NOW! Hi There! We are looking for experienced people that might be interested in from working their home on a part-time basis. If you want to earn $100 a day, and you don’t mind developing some short opinions up, this might be perfect opportunity for you! Simply check out the link here NOW! The team behind the thought process has been completed by world renowned architecture, individual that managed to create sculptural spaces using the transitional spaces, giving them aesthetic values along with the common functional ones. Alta Vista is the best search engine on the planet . I like the valuable info you supply to your articles. I will bookmark your weblog and check once more right here regularly. I’m moderately sure I will be informed a lot of new stuff right right here! Good luck for the following! Thank you for any other informative site. Where else may just I am getting that type of info written in such an ideal method? I’ve a mission that I am simply now running on, and I have been at the look out for such information. With havin a lot content and articles do you have any problems of plagiarism violation? My website has lots of exclusive content I’ve created myself or outsourced but it seems a lot of it is popping it up all over the web without my permission. Do you know any ways to help protect against content from being ripped off? I’d genuinely appreciate it. site so much up very fast! What host are you the useage of? Balaji Travels by Rasabihari Ramkrishna Sikdar is a SCAM! One thing is that one of the most widespread incentives for applying your credit card is a cash-back or maybe rebate provision. Generally, you’ll receive 1-5 back upon various purchases. Depending on the cards, you may get 1 returning on most acquisitions, and 5 again on purchases made from convenience stores, gasoline stations, grocery stores as well as ‘member merchants’. Hi There! We are looking for some people that are interested in from working their home on a part-time basis. If you want to earn $200 a day, and you don’t mind writing some short opinions up, this might be perfect opportunity for you! Simply check out the link here NOW! I am now not certain where you’re getting your info, however good topic. I needs to spend some time studying more or understanding more. Thank you for wonderful info I used to be on the lookout for this information for my mission. Very good blog post . I absolutely appreciate this site . Stick with it! I thank you a lot for your precious time in writing this blogpost. Thank you a lot for your time in writing this article. I’ve been browsing online greater than 3 hours nowadays, yet I by no means found any interesting article like yours. It is pretty value sufficient for me. Personally, if all web owners and bloggers made just right content material as you did, the web will be much more helpful than ever before. Hey there , Good piece of writing and so educative. Good to view your current website. Please reply back as I’m trying to create my own personal blog and would love to learn where you got this from or exactly what the theme is named. I surprise how so much attempt you put to create this type of wonderful informative site. coming near near post. Thank you 1,000,000 and please keep up the enjoyable work. I don’t even know how I ended up here, however I assumed this submit was good. I don’t recognise who you’re but certainly you’re going to a well-known blogger in the event you are not already. Thanks for any other informative blog. The place else could I am getting that kind of info written in such an ideal method? I’ve a challenge that I’m just now operating on, and I’ve been on the look out for such info. Very good blog! Do you have any tips and hints for aspiring writers? I’m hoping to start my own website soon but I’m a little lost on everything. Would you suggest starting with a free platform like WordPress or go for a paid option? There are so many choices out there that I’m totally overwhelmed .. Any recommendations? Cheers! hello there and thanks on your information – I have certainly picked up something new from right here. I did on the other hand experience several technical issues the usage of this web site, since I experienced to reload the website many occasions previous to I could get it to load properly. I were brooding about if your web host is OK? Now not that I’m complaining, however slow loading circumstances times will often affect your placement in google and can harm your quality score if advertising with Adwords. Well I am adding this RSS to my e-mail and can glance out for much extra of your respective fascinating content. Ensure that you update this again very soon..
You are absolutely right and I understand you. When you wish, we might as well speak around noise cancelling bluetooth headphones, something which intrigues me. The site is certainly brilliant, all the best! It is a truth that most of the world’s media is owned by right wing capitalists. Their aim is to further the cause of capitalism and retain the world’s differentials between rich and those in need. Left Insider provides left wing articles from reputable news sites such as Left Futures, Red Pepper, Novara, The Canary, Buzz Feed, Left Foot Forward etc. We all have the right to maximise our own potential and we all have the duty to help others achieve theirs. I every time emailed this web site post page to all my friends, because if like to read it next my links will too. Hi there! Someone in my Myspace group shared this website with us so I came to check it out. I’m definitely enjoying the information. I’m book-marking and will be tweeting this to my followers! Fantastic blog and excellent design and style. Hello! Someone in my Facebook group shared this site with us so I came to take a look. I’m definitely enjoying the information. I’m book-marking and will be tweeting this to my followers! Wonderful blog and great design and style. Thanks for your marvelous posting! I genuinely enjoyed reading it, you will be a great author.I will make certain to bookmark your blog and will eventually come back later on. I want to encourage you to definitely continue your great work, have a nice morning! This was a great post. Thanks for sharing. My friend sent it to me on Twitter. Howdy! This post could not be written any better! Reading through this post reminds me of my good old room mate! He always kept talking about this. I will forward this page to him. Fairly certain he will have a good read. Thank you for sharing! in touch extra approximately your post on AOL? I require an expert on this house to resolve my problem. Thanks for your personal marvelous posting! I truly enjoyed reading it, you are a great author.I will remember to bookmark your blog and will come back later in life. Hey there, You’ve done a fantastic job. I will definitely digg it and individually recommend to my friends. I am sure they will be benefited from this site. Howdy! I know this is kinda off topic however I’d figured I’d ask. Would you be interested in trading links or maybe guest writing a blog article or vice-versa? My site goes over a lot of the same subjects as yours and I think we could greatly benefit from each other. If you happen to be interested feel free to send me an e-mail. I look forward to hearing from you! Fantastic blog by the way! I discovered your blog web page on google and check a few of your early posts. Continue to keep up the incredibly superior operate. I just further up your RSS feed to my MSN News Reader. Looking for forward to reading extra from you later on! Let me know if you’re looking for a article writer for your site. You have some really great posts and I think I would be a good asset. If you ever want to take some of the load off, I’d really like to write some material for your blog in exchange for a link back to mine. Please send me an email if interested. Kudos! The heart of your writing while sounding reasonable at first, did not settle very well with me after some time. Somewhere within the sentences you actually were able to make me a believer but just for a very short while. I still have a problem with your leaps in logic and you would do nicely to fill in all those gaps. When you can accomplish that, I could undoubtedly be impressed. Aw, this was a seriously good post. In idea I’d like to put in writing like this furthermore – taking time and actual effort to make a very excellent article… but what can I say… I procrastinate alot and by no means appear to obtain one thing completed. Great post. I will share it on my Facebook page. Thank you so much. My friend will also share. I saw this article posted on my cousin’s Facebook feed. thanks for the great info. Hi! This is my very first reply here so I really wanted to give a fast hello and tell you I genuinely enjoy reading your blog posts. Can you suggest any other blogs which go over personal injury lawyer? I am also highly curious about this thing! Appreciate it! Attractive element of content. I simply stumbled upon your web site and in accession capital to say that I get in fact enjoyed account your weblog posts. Any way I will be subscribing for your feeds and even I fulfillment you access persistently quickly. I just came over here via a different page relating to omega xl pills and imagined I might consider this. I quite like what I see so now I”m following you. Looking forward to looking over the site again. This is a well researched piece of content. I’m sure you get tons of visitors to your website. I’ll be sharing this on Facebook. You are absolutely right. I liked reading this article and I will certainly get back for more straight away. Our site is on omega xl features, you could look if you are still interested in this. I really liked the design when I first got to this site. Grat article. Well done! Thank you! Thank you for producing great content. Good content like this can be hard to find sometimes. Thank you. Hello! Someone in my Myspace group shared this site with us so I came to give it a look. I’m definitely loving the information. I’m book-marking and will be tweeting this to my followers! Outstanding blog and wonderful design. am getting know-how every day by reading such nice articles. I’ve never really thouoght about those points before. I want to share this blog post on my Facebook page. I was listening to my favorite song when I came arcoss this article while searching in Google. Thanks. It was awesome. Did you design this site yourself or did you get a professional to help design it? It looks great and I’ll visit again. Thanks. wowowowow I was checking around the internet doing Bing searches and found your website. Great site!!! I just could not depart your site prior to suggesting that I really enjoyed the usual info a person provide in your guests? Hello! I’ve been following your web site for some time now and finally got the bravery to go ahead and give you a shout out from Lubbock Texas! Just wanted to mention keep up the fantastic work! I know this website gives quality based posts and other information, is there any other web site which presents these information in quality? reason that this this web page conations really good funny stuff too. I’ve visited your weblog site, and have even analyzed a material there. It is interesting! You are totally correct. I really liked reviewing this and I will certainly return for more as quick as possible. Our internet site is on upvc windows and doors, you can look if you are interested in this. I was reading your blog while vacuuming (I have an automatic vacuum so secret: I was sitting on my couch lol!) Good…. Thanks a ton for discussing the idea, I bookmarked the webpage. I’m also attempting to find facts regarding Arvind Pandit, do you know exactly where I could discover one thing such as that? I’ll come back in the future! I was looking out my window at the trees observing the birds when I came across your website and read this great article. Cool	o! You website is always so refreshing and relaxing to read. I come here when I get angry and upset. Awesome!! I really apprecieate well written content like this. I like what you said in the 2nd paragraph. So interesting.. I really enjoy a nice cup of coffee under a blanket while reading your blog. Great stuff here. Thank you so much!!!! It’s so funny I was just thinking the same thing while reading your website’s blog. Cool and awesome!! I always find myself listening to music when I browse your website and read your interesting blogs. Great job! Nice job and well done on the design of you website. It remind of walking through the woods on my 16th birthday. Cool! It’s crazy how much we think alike. That’s why I always come back and check for new blog posts. Amazing stuff..
You’re absolutely right and I totally trust you. When you wish, we might as well speak around building intercom system, a thing that intrigues me. Your site is definitely amazing, take care! I frequently look over your articles closely. I’m furthermore interested in how to get followers on instagram, maybe you could write about this from time to time. Bye. I’m impressed, I have to say. Seriously rarely do I encounter a blog that is both educative and entertaining, and let me let you know, you’ve got hit the nail on the head. Your concept is outstanding; the issue is one thing that not enough individuals are speaking intelligently about. I am quite pleased that I stumbled across this in my search for something relating to this. Hello! This is my very first reply here so I just wanted to give a quick shout out and tell you I genuinely enjoy reading your blog posts. Can you suggest any other sites which deal with free tv streaming? I’m as well quite hooked on that thing! Thanks for your time! Thanks a lot for this awesome posting! I genuinely appreciated reading it.I’ll ensure that I bookmark the blog and will return in the future. I would really like to encourage you to ultimately continue your wonderful posts, maybe discuss personal injury attorneys also, have a good evening! I really enjoy listening to Elvis when I read your blog. They go together great like apples and pumpkins. LOL!!!! This was so crazy one day i saw this post and liked it so much I am here again. It was great reading this info and I feel you’re entirely correct. Tell me if you are looking into where to buy ethereum, this is my major competency. I hope to hear from you soon, cheers! After my trip from Germany, I was browsing some websites and saw your blog posted. It’s really great. Thank you..
Who would have thought my cousin and I would like the same website like this. He saw this post on my Twitter feed! I dropped my phone and then when I bent over to pick it up, I noticed my phone landed on this blog post. Crazy…. Good Webpage, Continue the fantastic job. Appreciate it. It was so crazy, I was just walking down the street to my favorite park and someone gave me thier phone with this website loaded on it!! I am now not sure where you’re getting your info, however good topic. I needs to spend some time learning much more or working out more. Thanks for wonderful info I used to be in search of this information for my mission. I frequently read through your content closely. I’m furthermore curious about canon printer updates, maybe you might talk about this sometimes. Good day! Many thanks for sharing this, I saved the web page. I’m furthermore looking for details regarding how to get bitcoins, are you aware the place where I could come across one thing like that? I will return very soon! We really love your blog and find almost all of the blog posts to be exactly I am seeking. Do you offer people to post information for you? I wouldn’t mind writing a post regarding pc games or on most of the subjects you’re writing about here. Awesome page! I like what you dudes are now up to. This sort of smart effort and coverage! Continue the fantastic work friends, I have incorporated you on my own ocean freight website. I was playing videos game, GTA 5, and then I noticed this blog post was on my phone. It was crazy. Cool…. Has anyone ever told you that your site reminds me of an early morning stroll through the desert while wearing glasses!! Hi. Just wanted to share with you the best of Europes festivals over the past few months. We have visited most of these in the past and I can assure you that they are brilliant. Find time to enjoy life and attend some of these this year. Looking forward to some more interesting posts on the Marina de Bolnuevo blog (www.marinedebolnuevo.co.uk). Have a great day. I really like what you fellows are up to. This sort of smart effort and visibility! Carry on the very good work guys, I have added you on express shipping web page. Hey there. I recently noticed this amazing site and I certainly like it. I like to focus on mesothelioma lawyer center at times. Good to be here, cheers! I’m not sure where you’re getting your info,but great topic. I needs to spend some time learning much moreor understanding more. Thanks for magnificent info I was looking for this info for mymission. Hello, you are certainly correct. I always look over your posts carefully. I’m likewise thinking about stream movies, you could write about this occasionally. Good day. Immediately after study a couple of of the weblog posts in your web-site now, and I really like your way of blogging. I bookmarked it to my bookmark web-site list and is going to be checking back soon. Pls check out my website at the same time and let me know what you believe. Thanks a ton for sharing the idea, I bookmarked the site. I’m furthermore looking for data on dental bridge cost, do you know the place where I can discover a thing such as this? I’ll be back in the future! Hello, what do you really feel concerning latest movies online? Really fascinating topic, isn’t it? I am a huge fan of The Cure. I think we would get along very good in real life. Your writing is excellent! This truly and really was a great piece of snad in the hourglass. That 2nd paragraph was outstanding!! Eveгything іs very open wіth a precise explanation of the challenges. It was truly infoгmative. Your site is extremely helpful. There was one time that I went to bed and then I thought about my favorite songs and then I found this blog!! I love eating a large cheese pizza while drinking a cup of coffee in the moring while reading your blog..
Hi there. I was just on my way to the middle of the ocean and I decided to stop and read this article. Hello there, I found your site by way of Google even as searching for a comparable subject, your web site got here up, it appears great. I’ve bookmarked it in my google bookmarks. Do you know what a bollard is? I reaed about them one time in France. It is so cool I think it’s awesome! I was wondering how to find the best way to get to the middle of the city in the game of thrones inside tours! You should check out the awesome music of Wevie Stonder. Ton Wah is an awesome song you would like!!!! Aw, this was a very nice post. In concept I want to put in writing like this additionally – taking time and precise effort to make an excellent article… but what can I say… I procrastinate alot and on no account appear to get something done. Sophia…omg thanks for the FB monetizatin comment above. A lot of thanks for all your hard work on this web page. My daughter take interest in participating in investigation and it’s easy to see why. A number of us know all regarding the lively form you produce efficient things by means of your web blog and as well foster participation from other individuals on this idea so my princess has been understanding a lot. Have fun with the rest of the new year. You’re conducting a good job. I think Justin Bieber should run through a cow field while eating a burrito and singing baby and jumping! Here was a great example of bravery and continued excellent writing skills to the test. Well done? Have you ever heard of bacon? It’s one of the best foods I’ve ever experienced eating in my entire lifetime!!!! I really enjoy listening to Mogwai while reading your blog. It’s so cool and awesome and soothing when I sleep!!! I ate so much chicken last week I think I might lay an egg. I hope it hatches into a baby chicken.. I always over cook my eggs whenever I run outside to throw away the garbage. I need to get better at doing that? Valuable information. Lucky me I discovered your web site by accident, and I am shocked why this twist of fate did not happened in advance! I bookmarked it. The best song in the world ever ever was stuck in my head all through high school. I’ll never forget that! There are actually remarkable improvements on the design of the webpage, I truly love it! My own is relating to wealth generation forex and generally there are lots of stuff to do, I am still a novice in webpage design. Thanks! I like trains and watching them run along the track of the south. It is very entertaining to see all of them??? You are totally right and I definitely understand you. If you want, we could also chat around followers instagram, something that fascinates me. Your website is definitely impressive, best wishes! Excellent site you have here but I was curious about if you knew of any message boards that cover the same topics discussed here? I’d really love to be a part of group where I can get suggestions from other knowledgeable people that share the same interest. If you have any suggestions, please let me know. Thank you! I thought I once threw a baseball over the Atlantic Ocean. Turns out it flew over a tree into my neighbor’s house! I wish there was a way to teleport to other countries. I want to visit Antarctica, but would hate the airplane ride.. I am really curious to understand just what website platform you are utilizing? I am experiencing some slight security difficulties with the latest blog on commercial land for sale and I would love to find a thing a lot more risk-free. Are there any alternatives?